Synopsis: Mid-level low pressure is forecast over the Western U.S. in week-2 favoring periodic impulses of shortwave energy to eject out of the Rockies. These disturbances are favored to rotate around the periphery of surface high pressure over the East, resulting in intermittent chances of unsettled weather throughout the period. Moderate risk of heavy precipitation for portions of the Central and Southern Plains, and the Middle and Lower Mississippi Valley, Thu-Fri, May 2-May 3. 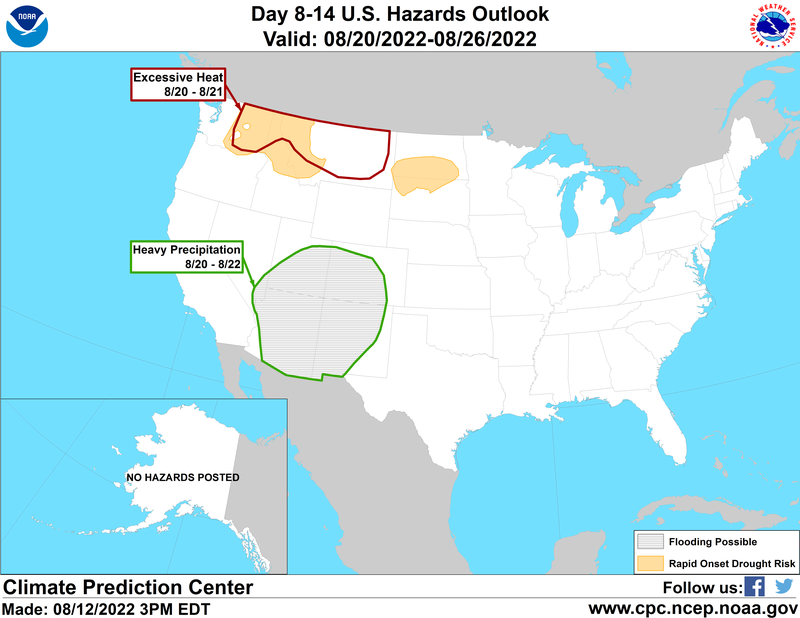 Slight risk of heavy precipitation for portions of the Central and Southern Plains, the Mississippi Valley, the Central and Southern Appalachians, the Great Lakes, the Ohio Valley, the Tennessee Valley, the Northeast, and the Mid-Atlantic, Thu-Wed, May 2-May 8. Slight risk of much below normal temperatures for Montana and adjacent areas, Thu, May 2. For Thursday May 02 - Wednesday May 08: A noticeable shift in model guidance today has resulted in some changes to the hazards outlook compared to yesterday. A stronger trough is now favored in the Western CONUS early in week-2, along with an eastward displacement of the mid-level ridge and surface high pressure in the East. Because of the increased troughing in the West, there is an increased risk for cooler temperatures early in week-2, with a slight risk for much below normal temperatures (20% chance of minimum temperatures in the lowest 15th percentile of the climatological distribution) now posted over much of Montana, Northern Wyoming, and the far Western Dakotas on 5/2 given the potential of a hard freeze in some areas. This is based on guidance from the GEFS reforecast tool. Snow is also possible early in the period over this region as shortwave energy may interact with the cold air in place. With the eastward shift in the ridge axis, the precipitation axis is also shifted southward and eastward compared to yesterday. A disturbance ejecting out of the Rockies early in the period favors a heightened chance for heavy precipitation across the Plains early in week-2. The GEFS focuses the heaviest precipitation across portions of the Central Plains and adjacent parts of the Mississippi Valley, while the ECMWF ensembles favor the Southern Plains to have the highest precipitation totals. Synoptically, the overall set-up looks conducive for a convective event, and therefore a moderate risk of heavy precipitation (40% chance of precipitation in the highest 15th percentile in the climatological distribution) is highlighted for parts of the Central and Southern Plains along with western parts of the Middle and Lower Mississippi Valley. Throughout week-2, this along with other disturbances are favored to track around the periphery of surface high pressure over the Southeast and Western Atlantic, resulting in intermittent chances of heavy precipitation. Therefore, a slight risk of heavy precipitation (20% chance of precipitation in the highest 15th percentile in the climatological distribution) is posted for a broad area extending from the Central and Southern Plains northeastward through parts of the Mississippi Valley, the Ohio Valley, and into the Mid-Atlantic and Northeast for the entire period. No areas of hazardous winds are posted, although some gusty winds are possible in parts of the High Plains during week-2. Ridging is forecast over Alaska in week-2 with some troughing forecast to develop over the Bering Sea toward the middle of week-2. Precipitation threats look minimal and therefore, no hazards are posted for the state. $$ Please consult local NWS Forecast Offices for short range forecasts and region-specific information.